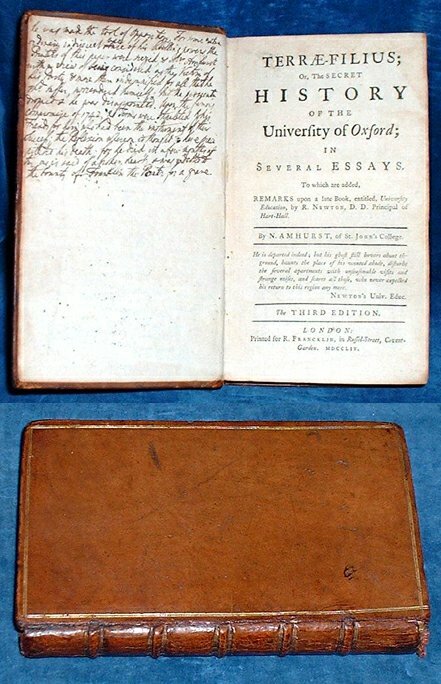 Title: TERRAE-FILIUS; or, the secret History of the University of Oxford; in several essays. To which are added, remarks upon a late book, entitled, University education, by R. Newton .. Description: London, Francklin 3rd edition 1754 . Duodecimo contemporary gilt calf raised bands (hinges cracked). Ownership J.R. Hayes Mert.Coll. 1771 on free endpaper with neat contemporary notes on history of this work, xxiii +pp +advert leaf. *Amhurst was expelled from Oxford in June 1719. Terrae Filius (first published 1721 in 50 periodical papers) was his revenge on the University, which he satirises severely (DNB).